Blogs Help You Get Found Online. How? By Regularly Publishing Dynamic Content That Connects With Customers. Simple Marketing Now believes strongly in content marketing (i.e, creating valuable and informative content worth exploring and engaging with) and inbound marketing (i.e., marketing that drives visitors to you because you offer worthy content). Blogs combined with social media marketing help you create and share content which, in turn, attracts new visitors to your website and blog. In fact, here are two recent blog articles on the subject: Why Blogs For Business? For Content That Connects With Customers and How To Write a Blog Article or Post: 13 Tips. As you explore these blogs, you'll notice that each one focuses on a different topic and appeals, for the most part, to a different audience. Let us know what you think. We welcome your questions. We also hope you'll let us know when you and your organization start with blogs! 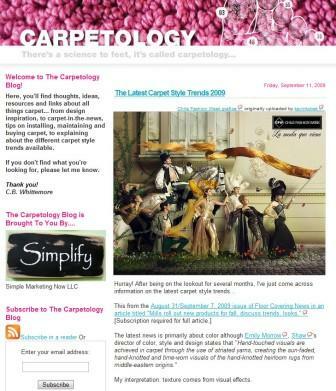 The Carpetology Blog is about all things carpet, with special emphasis on carpet style, carpet style trends, carpet design inspiration, carpet comfort, carpet care and maintenance... Let's not forget carpet in the news, either. It was the very first flooring blog and carpet-focused blog. This blog reaches out to consumers and those wanting to learn more about carpet in anticipation of a carpet purchase, or -once purchased- how best to care for their purchase. This site educates and celebrates a product that plays an important role in home design, yet is rarely sold as such. It was originally created to support the Wear-Dated carpet brand and a soon-to-be-launched social friendly website [read the Carpetology Blog case study as well as the Website Redesign case study]. You'll find the YouTube series titled "A Foot's Perspective" as well as the informative "Annette's Carpet Corner" on how to care for carpet.